Even with a small outside space it’s possible to grow fruit and vegetables in pots. This is what they look like now…. The containers planted with beans, squash, peas and carrots were grouped together, against a south-west facing wall. As a result they would get a lot of afternoon sun but perhaps more importantly for the beans, they were in a relatively sheltered position. One of the pots was planted with the same batch of climbing bean plants that had been planted at the school, so this was a bit of an experiment to see which beans would do better: the ones at the school’s open site versus mine in pots but in a sheltered position. As it turned out there were uncharacteristically strong winds in spring and the beans did suffer in both locations so, as a precaution, I sowed another climbing bean in June which was another experiment to see whether leaving it so late would mean a smaller harvest. I put it in a large pot together with two squash. So far this seems to be a good combination. The bean plant is a bit behind the others of course but they all seem happy enough together and one of the squash is now even fruiting. Finally, after having lost the label earlier in the season, I can see the variety of squash it is- Gold Rush Squash! The pots with kale, chard, lettuce and strawberries are, in contrast to the others, positioned where there is less (intense) sun, receiving dappled shade from the nearby apple trees for part of the afternoon. This seems to be working out well for them. 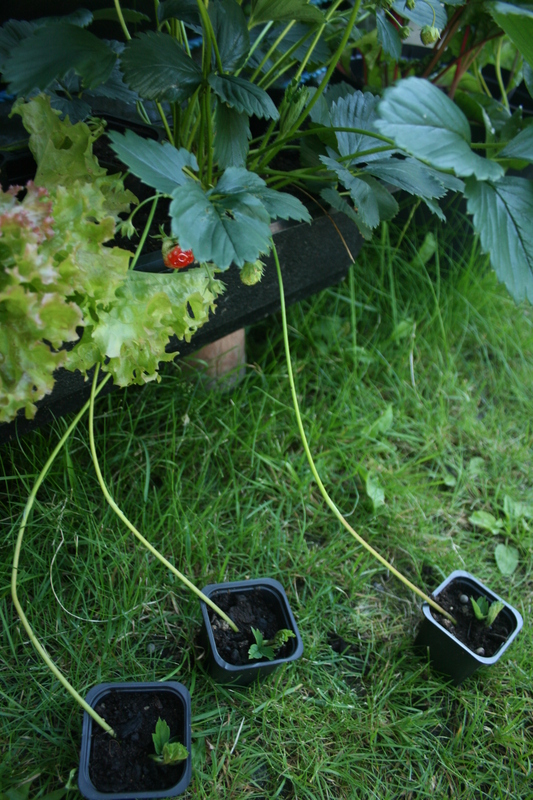 You’ll remember the strawberry plant that had looked a bit forlorn earlier in the year. It is now fruiting and sending out runners voraciously. You have to keep your eye on it, as it’ll sneakily send out runners when your back is turned! I’ve already trimmed a lot off as they say that you’ll get more fruit if you do, but I have decided to let some grow so I can give away some mini strawberry plants to the school later on. Cut out the main red ribs of the leaves, cut in half and set aside. Roll up the leaves and cut cross-ways, producing strips. Chop an onion and slice some garlic. Fry the onion and then add the garlic in olive oil until softened. Add the ribs and fry for about 3 minutes, then add the leaves and fry for another 3 minutes until wilted and soft. Categories: Food growing, Monthly garden updates | Tags: beans, kale, recipes, squash, strawberry | Permalink.